Cappellano, father Teobaldo who has since passed away, was the first vintner in Italy who opened his arms wide to me and took me under wing in a most generous way, introducing me to the Italian who’s who and gently ignoring my blatant ignorance of matters vinous back in the day. Teobaldo came to Prague to visit twice. I counted him as a dear friend and an inspiration. 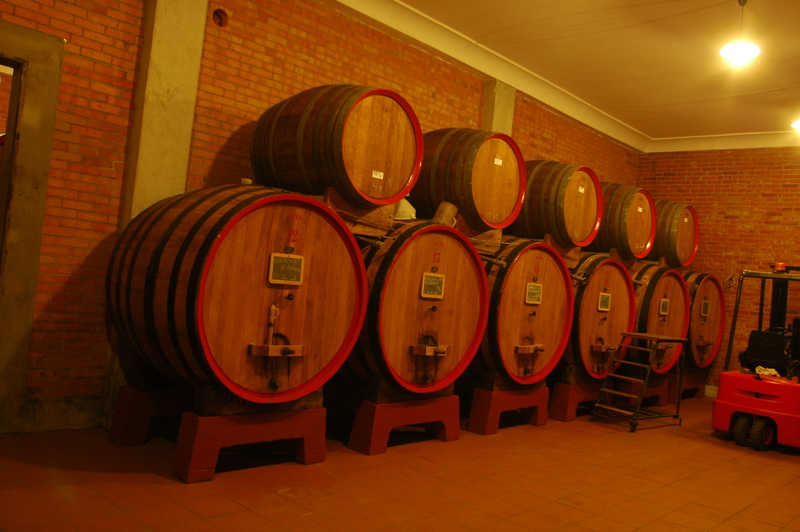 The estate comprises 6ha of which 4.5ha are planted to vineyards. His son Augusto is made of the same matter. Until Teobaldo’s passing, Augusto was long hesitant to choose the wine profession as his future, and justly so. With the all-dominating presence of his father I must have been difficult to come out of the shadows and bear his own wonderful character to bear. During the last couple of years Augusto has finally succeeded in coming into his own. He is a splendid person with similar ideals, ethics and aspirations as his father, and recently I sense that this road of his own that he has finally embarked on may even take him further in terms of wine quality than before. I wish him the best of luck for his sake, and for ours. The Cappellano name is very old in the Barolo area. The family was one of the historical local negociants or rare purchasers of Nebiolo and bottlers. 50 years ago most farmers grew grapes in the Langhe and sold them on the main square in Alba to merchants who bought, vinified and sold the wines as their own. Only recently has the wine revolution, materialistic improvements in the first world, search for more aesthetic pleasure and consequentially greater emphasis on enogastronomy, resulted in farmers bottling their own wines. In France the negociant is still very active, but in Piedmont negociants understood as early as the ’60’s that it was time to invest in and farm the land on their own, because sooner or later there wouldn’t be good grapes to come by. The Cappellano story is different, because there was a generational discontinuation of producing wine in the 20th century, when Teobaldo’s father joined the army, fought in Ethiopia and settled there with his Ethopian wife. Teobaldo was born to a Barolo father and Ethopian mother, which might go a long way to explaining his delicious, parallel thinking (ed. Teobaldo often described people he was very fond of as delizioso). 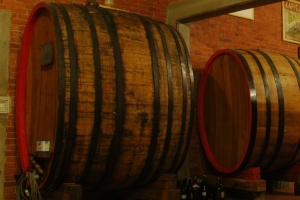 As a adult Teobaldo returned to Barolo and bought a large part of the Gabutti grand cru as well as a parcel in Novello. Above all, Teobaldo was firstly a poet and secondly a vintner. The Gabutti purchase was fateful, since it remains today one of the rare examples in the Langhe of an intact natural habitat. Located in the lower part of Serralunga d’Alba facing the Castle of Serralunga with a south exposure and a very steep incline, the vineyard is sorrounded on all sides by woods. Below the vineyard runs a stream, fruit trees have been planted. Animal and bird life is audible. Exactly what I would expect in the countryside if I wasn’t used to the extreme monocultural moon landscapes of Barolo which are praised the world over. The soil composition is marly limestone, in this case the most sought-after Nebbiolo soil locally called marna blu, since its predominantly white chalky composition has a bluish hue. Apart from the wonderful Dolcetto and Barbera, there are two very important differences between the Nebbiolo selections in Gabutti. The Piè Rupestris, or American root stock grafted, vines were planted in 1946 and part in 1954. Please note that until the 1950’s vines were grafted in the vineyard with great skill, not in a nursery. The Rupestris rootstocks are of very high quality. The clones are Lampia, Rosé and Michet. The Pié Franco Michet, or original rootstock selection as in “Franc de Pied”, side of the Nebbiolo vineyard in the Gabutti cru was planted in 1989. Michet is one of the three Nebbiolo clones, the others being Lampia and Rosé. Rosé is very rare since the grape bunch tends not to flower completely and is therefore sparse with resulting less production. It has a very light color which discriminates it further. Lampia is the most wide-spread Nebbiolo clone and the berry cluster is the largest with a long tail-like grape bunch extension. Michet is in fact a natural viral mutation of the Lampia clone, which practically does away with the tail, thus allowing more nutrition to a small, more compact grape bunch. It is a Michet selection that Teobaldo chose for his ungrafted vineyard. Both barolos have the name Otin Fiorin in their title. This is a dedication to the man who tended the vineyard for many years. So we have the grand cru Gabutti vineyard with the same soil composition, the same exposure and steep gradient, with a grafted parcel of older Nebbiolo vines on one side, separated by three meters from the ungrafted parcel of younger Nebbiolo vines on the other side. There are no other differences, not even during the vinification processes. Yet the Barolo Franco is always a more complex wine. And how did it come about that Teobaldo had a parcel of ungrafted Nebbiolo vine stocks planted in 1989? He planted them himself! I remember asking Teobaldo about the process. He explained that it was nerve-racking not only because of the highly publicized risk of phylloxera, but also because Teobaldo stubbornly stuck cuttings straight into the soil and it took five years before the whole vineyard had survived and taken root. During these five years 20% of the cuttings took root. The sacrifice has paid off. Cappellano have the only ungrafted Nebbiolo vineyard in Langhe, and what a difference. That said however, Teobaldo and now Augusto let all their wines speak without altering their varietal characters and terroir profiles, which makes Cappellano wines perhaps the most characterful of the top 10 in Langhe. I often notice that the Nebbiolo grape variety is one of the most demanding for wine consumers to get to grips with, yet once you’re hooked it’s for life. Among the exciting wines in Langhe, Cappellano tends to be the most complicated for consumers. Many people are turned off by the big, personal and authentic character of Cappellano wines. Those who venture on invariably become fans. Lastly, the price - quality ratio is excellent. Alba’s winemaking history has left us the memory of doctor Giuseppe Cappellano as a major figure from the beginning of the twentieth century. What few people know is that this ingenious pharmacist, the inventor of Barolo Chinato, took over the winery after the sudden death of his older brother Giovanni who had the same entrepreneurial genius. They were both sons of Filippo Cappellano, the last in a long line of notaries. In 1870, at the age of 48, the notary Filippo established the Cappellano winery, making large investments for the period and incorporating some 150 Piedmontese giornate (old Piedmontese measurement unit for plots of land generally equal to 3810 m²) of cultivable land in the property. On his death in 1886, as was customary during this period, his two daughters received dowries of 100,000 lire each, significant sums of money at the end of the 19th century. As regards his two sons, the youngest, Giuseppe, continued his studies, while Giovanni, just turned 19, left his university studies in favour to manage the estate. Giovanni’s capacity and entrepreneurial spirit were not lacking and within a few years he had not only restructured the cellar in Alba but also built two hotel structures (in Alba and in Serralunga) furnished with all major amenities to serve a budding Langhe tourism. In time the wine production not only supported the two hotels but also serviced a stable clientele prevalently from Liguria and Piedmont. The Cappellano winery won a bronze medal at the 1889 World Exhibition in Paris, which was organized in commemoration of the 100th anniversary of the French revolution with the inauguration of the Eiffel Tower. After that diplomas, medals and commendations followed in stride with the competitive spirit of Giovanni Cappellano. It is the beginning of the 20th century and young Giuseppe has now completed his pharmaceutical studies with honors. After a brief professional stage in Turin, he decides to pursue an industrial viticultural-pharmaceutical direction. 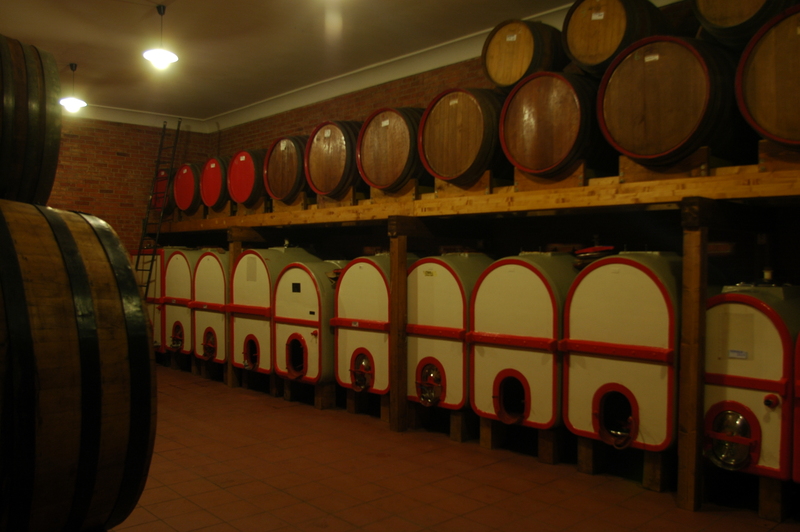 During this period he produces his first grape jellies, medicinal grape concentrates, and he invents Barolo Chinato. The wine pharmacist produces a product that will remain a mythical elixir for many years, a family medicine to the poor peasants of the Langhe area. However, the industrial adventures of Giuseppe Cappellano were not to last long. In 1912 he is summoned to administer his brother’s estate who had died prematurely. That year Giovanni Cappellano passed away from a tropical illness that he had contracted in Tunisia where he had gone in search of phylloxera-resistant grape varieties. So it happened that doctor Giuseppe Cappellano returned to the estate that had been established by the father and brought to fame by his brother Giovanni. When he become proprietor, he was able to build on the success due to his contacts with Turin bourgeoisie and his friendship with count Mirafiore. Active years followed with the production of important Langhe wines, the now famous Barolo Chinato and substantial land acquisitions in dedicated areas. During this period a family tragedy marks his soul and character: the loss of his only daughter to an attack of the Spanish flu. In her memory Giuseppe builds and donates the Maria Cappellano square to his home village Serralunga, where it remains today. The rest is recent history still told by the old villagers who remember the gentleman, father and proprietor of this area. Under an agreement with the Gancia estate in Canelli, Cappellano was entrusted with vinification on its behalf as well as the Mirafiore brand and the ‘Fini’ wines from the Alba area, making Cappellano the biggest grape purchaser in the area. So many grapes were purchased during the harvest that endless queues of carts were a common sight in front of the Cappellano winery. Dott. Cappellano was renowned for his knowledge of grapes, excellent crus, ambitious peasants and microclimatic effects. In 1955 Giuseppe Cappellano passed away, leaving his heritage to his grandchildren. Today, the Dott. Giuseppe Cappellano brand is maintained by two great-grandchildren who continue the noble wine-making profession. About 20 years ago Teobaldo was instrumental in blocking a subversive political move by other movers and shakers to allow the blending of other grape varieties than Nebbiolo in Barolo and Barbareco wines. In 1983 I asked the journalist Sheldon Wasserman not to publish scores for my wines. Not only did he not publish the scores: he also wrote that I had asked not to be included in “classifications” in which a comparison becomes a divisive numerical term rather than expressing human toil. I have not changed my mind: my tiny farm producing 20,000 bottles of wine a year interests only a small number of customer/friends. I believe in freedom of information, even if the judgement is negative. I think of my hills as an anarchical arena, with no inquisitors or opposing factions, whose inner richness is stimulated by severe, thoughtful critics. I strive for community that can still express solidarity with whoever has not been so well rewarded by Mother Nature. The estate comprises 6ha of which 4.5ha are planted to vineyards. The average production per year is 20,000 bottles. Plant density is 3-4,000 vines/ha. The vines are 30-70 years old. The training system is a modified Guyot, with a traditional training tendency. The vineyards are supported with green manure, i.e. alternating planting of nourishing plants that are tilled into the soil. Everything follows tradition. Only treatments that have been approved by organic agriculture are used. The soil is calcareous. 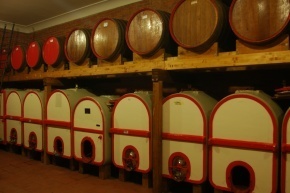 The altitude is around 300 m.
The wines ferment spontaneously. Not even a pied de cuve is used. There is no temperature control. 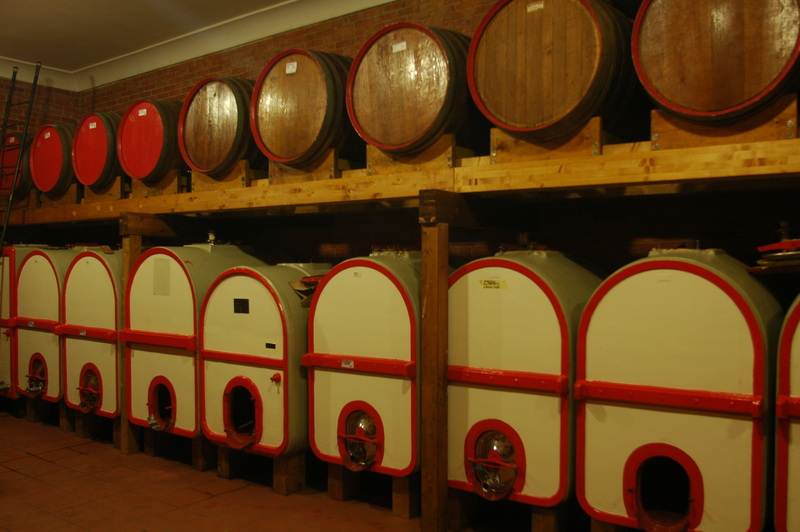 The process of vinification is traditional, i.e. 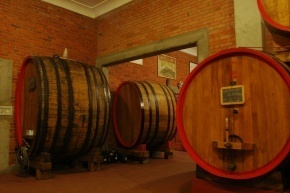 long macerations in glass-lined cement vats and botte, large Slavonian oak, chestnut and acacia barrels. The wines mature in old botte. They are neither clarified nor filtered. At the moment our producers, being “traditionalist”, are in vogue. It is flattering to see the press and mass consumer body increasingly acclaim this list of producers as top of the league. However I have seen wine trends come and go, and the ratings are not what counts. Important is how these people work day in and day out, their sacrifices, how great their vineyards are, long-term focus on what’s best for the wines, and certainly the character of the person also plays a part in the equation. Whether because the wine is rude, dirty, over-priced, all of these human attributes lend their weight to the final product which is wine. Lately it is no longer enough for me that the wine is natural or extraordinary, the holistic picture of the winery that emerges must make sense. I am not a star chaser and I pride myself slightly narcissistically on having a pretty good nose for the next wine revelation. It’s really not that difficult. It’s a sum of parts that, if they come together, create magic. If any nascent wine producers happen to read these remarks, please don’t be put off. Rome wasn’t built in a day, but it’s the overall methodology of trying to reach for the stars that separates the wheat from the chaff.